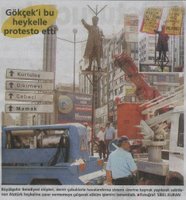 We awoke yesterday to the story of a staue of Atatürk being removed from the Kızılay district in the Turkish capital Ankara. Apparently, architect-sculptor Ragip Çeçen wanted to publicly demonstrate against Ankara Mayor Melih Gökçek for alleged failure to pay outstanding fees for work done. 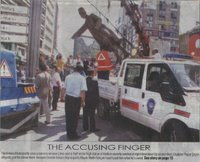 Aided by 6 frineds, the architect installed a 2.5m high statue of Atatürk at dawn while the attention of the police was focussed on a seperate demonstartion in another part of the town. The statue had to be removed by the Ankara Municipality using a crane. The sculpture depicted Atatürk pointing a finger and would be seen as a symbolic gesture pointing to the mayor's lack of commitment to the principles of Atatürk; Mayor Göçek is a member of the AKP government, an administration widely assumed to be less than enamoured with the legacy of Atatürk. The next day we wake to find media debate over how appropriate is to use the image of Atatürk for personal demonstration and there is a photo of Mayor Gökçek describing the act of misusing Atatürk as ugly. In addition to this bizarre story, the daily headlines report that AKP deputy Mr. Eyüp Ayar has been ordered to pay a fine of 5,000TL (approx. $3,200) for insulting Erkan Mumcu, leader of opposition party The Motherland Party (ANAVATAN), one of the opposition parties. The offending words were "You sly dog you" during a parlimentary debate. Also, Sabah newspaper have been fined 10,000TL for publicly humiliating Denis Baykal (Republican People's Party) by accusing him of hiding his financial assets. One really wonders if these politicians don't have anything better to do? No wonder the most part of 70 million people continue to struggle on while the politicians debate their personal attributes and keep lawyers in fees.